Finding an energy-efficient landscaping solution that’s right for your lawn can be difficult. When it’s time to clean up your yard and remove unwanted weeds, you probably use a mower or herbicides to complete the job. However, there’s a more efficient, eco-friendly landscaping solution out there – goats! With a diet that consists of around 70% of non-grassy vegetation, goats have no problem consuming the invasive weeds on your land. They aren’t picky eaters either, and could even be categorized as living garbage disposals – they’ll eat anything from dandelions, thistle and kudzu to poison oak and thorns. 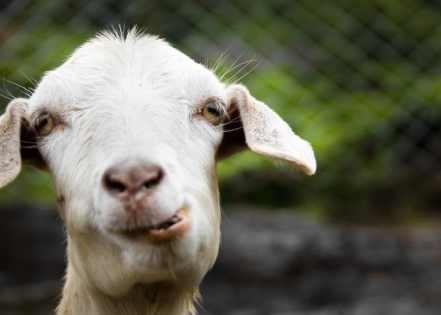 In fact, goats love to snack on poisonous weeds and have even grown a natural immunity to them. Not only is the goat-renting process eco-friendly, but it is also animal friendly. According to goat rental services such as Rent-A-Goat and Eco-Goats, their animals are all vaccinated, healthy and well cared for. Depending on the of your property, a temporary fence may be installed to ensure that the goats are contained in a specific area. For additional efficiency, a goat herder is also present throughout the grazing period. • Contact the company for an estimate. • Schedule a date for the company to evaluate your property, answer questions and determine if a goat rental is appropriate for your property. • Wait for set-up and the arrival of goats on your scheduled date. • Sit back, relax and let the goats to do their job! Your kids, friends or neighbors would love to watch the goats munch away on unwanted weeds. The amount of time it takes to clear the area is based on the property and the amount of unwanted plants. For reference, Eco-Goats provides potential customers with videos that show 50 goats working on a 4 acre, vegetation-dense property for 12 days and 30 goats on a .3 acre neighborhood property for 48 hours. When the goats have completed their job, the company will remove the happy – and, of course, well-fed – animals along with the fence, if applicable. It’s that easy! And you don’t even have to clean up after them when the job is done; goat droppings act as a natural fertilizer. Are goats actually a beneficial solution? Goat rentals have proven to be useful for a variety of reasons. Rent-A-Goat claims that this land-clearing method could save you up to 50% on your lawn care expenses. However, services are located in limited areas in the West such as California, Colorado and Wyoming. By consuming unwanted brush in the West, goats have actually helped reduce the possibility of forest fires. Google has even employed about 200 goats to clear weeds and reduce fire hazards at its headquarters. Also, depending on your property , you can find services on the East Coast, covering locations such as Maryland, Virginia, Delaware and Pennsylvania. So instead of hiring workers and acquiring machinery to do the same job, you could save money, be eco-friendly and entertained by renting goats. What a deal!